In celebration of International Women’s Day 2016, not-for-profit network, Females in IT and Telecommunications (FITT), hosted a luncheon at Doltone House in Sydney to celebrate women in the industry today. There was a strong discussion about the new ways individuals from private and public sectors can revive the modern image projected of women in ICT. Attendees heard industry leaders reflect on their own careers and discuss what actions society can take to enliven young women to choose the technology sector for their future career path. Department of the Prime Minister and Cabinet, first assistant secretary, cyber policy and intelligence division, Lynwen Connick, outlined the role of the public sector in the push for STEM such as the government’s practical approach in investing $13 million in it over the next five years. “The National Innovation and Science Agenda rightly identified that Australia needs more consurgent efforts nationally to overcome the cultural institutional and organisational factors that discourage young girls in studying STEM subjects that limits their ability in pursuing a career in ICT,” Connick said. Connick also said society can do more to highlight success stories of women in ICT. She said her team within the public sector have also been investing time into developing new programs to encourage women including the 24 hour hacking ‘Cyber-Security Challenge’, that had a huge number of women participants, including the first all female team in 2015. “I think it's the excitement about technology and what we can do with it that we really need to impart to people thinking about career options in ICT in the future. Above all, what we need to do is inspire. The opportunities to change the world in technology are never-ending in technology-related careers. This is our future, we need everyone to be part of it,” she added. Science in Australia Gender Equity (SAGE) steering committee co-chair, Susan Pond, said that whilst it would be beneficial to receive monetary support from bureaucratic counterparts, it would be more rewarding if it was self-initiated. “It takes a change in attitude in society which isn’t something that can be paid for, it has to be inculcated within the system,” she continued. Microsoft Australia managing director, Pip Marlow agreed with Pond in that the stereotypes and gender bias that exist today create friction and can repel women from particular careers. “It is difficult for young women to be what they can’t see. It’s not just government that is the problem, it’s a human problem and an industry problem,” she said. “We have to create role models and show young girls that the skills they can get by taking maths and by taking engineering, can be applied in almost any industry in the world. It’s not just the job of government, that’s why we are up here today, having these types of conversations. We have to keep creating a new environment for kids,” Marlow continued. 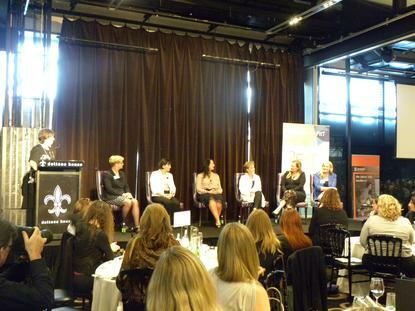 Intel managing director A/NZ, Kate Burleigh added that within the workplace, unconscious bias still exists and suggested professional women make their career goals clear. “If you really want it, make it clear that you really want it and don’t let people make their minds up about what you may or may not want,” Burleigh continued. Qlik A/NZ vice-president and regional director, Sharryn Napier, said moving forward, in order to create a culture within organisations, decisions must come from management. “Culture comes from the top. That is fundamentally the thing that drives the behaviour of the staff. I think it is everyone’s responsibility to call it out, but ultimately, the culture to do has got to come from leadership," Napier added.